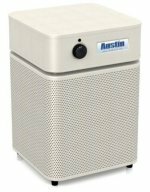 What is THE Best Powerful Air Purifier for Mold, Dust, Pet Dander, Volatile Chemicals, Odors, Allergies, and Asthma? Recently a visitor asked the Home Air Purifier Expert for a recommendation for the best powerful air cleaner able to efficiently clean the air of pollutants contributing to asthma and allergy symptoms in a large home. This homeowners wisely wants to remove all major indoor air pollutants such as: odors, chemical fumes, VOCs, dust, pet dander, and mold...all of which can worsen indoor allergies and asthma symptoms. 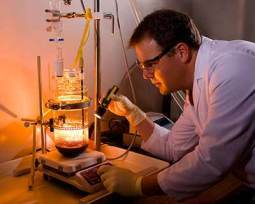 Filtering out these common indoor air pollutants requires an effective unit with high capacity for capturing the tiniest of solid particles (HEPA filters), AND Gaseous molecular filtration as well. This level of ultra high filtration ability and capacity will mean that most cheaper units are not viable options because they often lack the all-important ability to remove chemical gases. And particle filtration ability in cheaper units would also likely be sub-par for the pollutants in this large home. Following is the visitor's full question, and my tips and recommendations for the best air cleaner for this homeowner's specific situation. I have researched and read so many reviews on air purifiers. I want to explain my situation. I have a 4,000 square foot home. The lower level is approx. 2500 square ft and it is an open floor plan with high ceilings. I wanted to buy an air cleaner for the lower level that will blast through the rooms and clean out kitchen smells, mold, allergy related like dust, dander, and new paint smells from chemicals. I want a huge one that has it all. The upstairs has four bedrooms. The kids rooms all have attached bathrooms about 300 square ft each. Then the master is about 600 square ft.
We have mold issues in our home from moldy wood, two leaks, and the bathroom flooded and leaked downstairs so I had to have the ceiling replaced because of mold. Its all been fixed but we all got very sick and I am very scared about mold now. I want to make sure we have a mold killer just in case. The other issue is two of my children have terrible allergies and asthma. I need something from all three kids rooms and I too have allergies and have difficulty with breathing and want a 5th one for my room. Could you please make suggestions for all 5 areas and the best powerful units you recommend? I have been to Home Depot, Bed, Bath & Beyond, Best Buy, Lowes, etc. I purchased these items and tested them each but I don't know what is working the best? 1. Winix - WAC6300 seems to have good reviews but it doesn't work that well on smells in my opinion. It needs a small room because it was much too small for my bedroom. 2. Blue Air 403- Kept it for 1 1/2 months and it just died. It was working but it just stopped and wouldnt turn back on. 3. Therapure 90TP240TW01-W -seems to have good reviews but ??? 4. Sharp Plasmacluster FP-A60u - seems to have good reviews but will it work for mold, virus, lots of dust, allergies, asthma? 5. Germguardian 3-in 1 AC5250PT- Seems to be ok? Don't know for sure. 6. Airfree 3000- bought it on EBAY but its used and I don't know if its going to purify the air because your review says its not an air purifier but great on mold, virus, etc? I would really appreciate anything you could do to help us with the best air purifiers for my situation and not have a ton of costs and maintenence. No one in the stores are that knowledgable and I want purifiers that really work not just some store salesman that reads the boxes as he helps me. The long standing industry leader and #1 recommended choice for allergy and asthma sufferers is the highly advanced Swiss-made IQAir HealthPro Plus Air Purifier. This is the one I would buy if I were in your situation. It's THE best of the best. It is proven to ultra efficiently remove the broadest spectrum of air pollutants to such a high degree it is on par with high-tech clean room air purity standards. Each unit is rigorously tested before leaving the factory, and comes with a signed certificate of performance proving it is effective according to stringent standards of filter efficiency, noise levels, air flow rate, air-tightness, energy efficiency, and being Ozone emissions free. No other air purifiers could or would prove performance to this degree. The ability to clean air fast and efficiently via the 3 stages of filtration definitely makes Health Pro Plus the best air cleaning solution for all your asthma and allergy concerns in your large home of 4000 sq. ft. with 2500 sq. ft. downstairs, and 1500 sq. ft. upstairs. Each unit can cover up to 1125 sq. ft. (at a minimum of 2 air changes per hour), so ideally you would need several units per level of your home for best results. But you could start with one per level and would probably still notice significant improvement of symptoms. I would not go the route of cheaper units in each room. Most popular models are made to absolutely sound wonderful, but they are all sorely lacking in multiple ways when held up against an IQAir air purifier. Many lesser models require expensive and frequent replacement filters which makes their cost of ownership higher than an IQAir in the long run....and those filters are far far inferior in efficiency and scope of the pollutants removed. 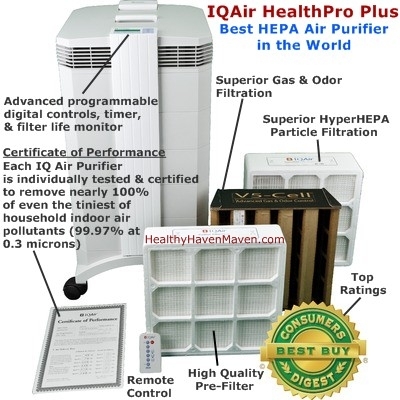 Click above to see more images, features, promotional deals, and expert consumer reviews of the IQAir HealthPro Plus HEPA Air Purifiers. At the heart of IQAir HealthPro Plus Air Purifiers is the world's most powerful, energy efficient, advanced motor & backward curved centrifugal fan assembly which pushes air through the advanced filter stages with minimal vibration and noise. It's the most powerful purifier on the market thanks to this advanced fan design and juiced up high quality motor. All aspects of HealthPro purifiers are carefully engineered and tested for maximum performance and efficiency - from the low emission ABS housing and engineered seals and sound dampening features....to the perfectly balanced fan and stainless steel ball bearings in the motor assembly. The high performance motor is also a huge step up above any other home air purifier. Cheap fans and motors is a very common point of mechanical failure and cause for poor performance in lesser units. Sufficient air changes per hour is a key factor to consider in the efficiency of any purifier, and units with weak motors can't move enough air fast enough. IQAir's motor and fan design is state-of-the-art and designed for a very long life of super powerful, quiet, and energy efficient operation. Variable speeds and digital programability is another advanced feature which allows customization for various situations. A 3 stage high capacity filter system includes: PreMax Pre-filter for capture of course particles which also helps to extend life-span on other filters....Hyper-hepa which provides clean-room quality particle filtering (much better than regular HEPA filters used in most other air cleaners)....and the special all important high capacity V5-Cell Gas/Odor filters. These are the most advanced filters available in any home air purifier. Together the multi-stages remove the broadest possible scope of all common household pollutants more efficiently than any other air purifier on the market. Most cheaper air cleaners suffer from poor design, expensive upkeep (frequent need for new replacement filters), by-passing of air around filter housing, low quality HEPA or false-HEPA filters. They also tend not to include the all important gas filters for removing the most damaging pollutants....gas-phase molecules that penetrate lungs deeply and enter the bloodstream. Toxic chemical fumes off-gassing from decor, furniture, electronics, building materials, cleaning products, ect. are some of the most common contributors to poor indoor air quality. These Volatile Organic Compounds are efficiently captured and destroyed by the special V5-Cell cartridges inside the HealthPro Plus. Many higher price point purifiers sometimes do include a filter stage for odors/chemicals (often with only lower grade activated carbon). But the amount of gas filtration media is miniscule, often a coating or dusting on filaments. It becomes saturated quickly allowing pollutants to pass through and back into room air. Scope of chemicals captured is limited too. For long-term effectiveness, you need the multiple POUNDS of special mixed gas filtering media (such as that found inside the HealthPro Plus V5 gas cell filters). The larger amount also means higher capture efficiency, and assures filter replacement is needed much less frequently - ultimately contributing to a lower cost of ownership (again longer filter life). I can relate to what you have experienced with the mold, chemicals, and other indoor air pollutants. For me it has been mold growing in my crawlspace (common here in the humid southern U.S.), and I've been busy re-water-proofing around the perimeter of my home, and installing ventilation fans to help reduce the odor and humidity. Having suffered from Sick Building Syndrome several times in the past, I have also converted to all green cleaners, and try to use only low VOC or no VOC paints and coatings, plus safer non-toxic alternatives of most other household chemical products. Overall, ever-reducing consumption is my ultimate goal. Besides IQ Air's Health Pro, my additional advice to help with your significant indoor air quality problems is to first be sure to reduce/remove any possible sources of indoor air pollution throughout, under, or around your home. Source control is THE most important step toward having clean indoor air. Air purification and ventilation are good supplemental measures. Double check that all those water leaks are fixed, and there has been no recurrance. I also suggest you do as I do...frequently inspect around attics, basements, kitchens, bathrooms, HVAC, and laundry areas for condensation or signs of water staining. Remove/thoroughly clean ALL moldy materials (mold is difficult to be rid of once it grows into the structural components of a home). See below suggestion about identifying a "hidden mold colony" issue. Reduce any possible off-gassing household chemical inventories in, under, or adjacent to the home. Examples to look out for are gasoline cans, paint cans, any type of solvents, and pool chemicals. Make bedrooms allergen free zones...no pets allowed, frequent cleaning, and think about using dust mite proof bedding and decor. Keep humidity relatively low too, not only to hinder mold growth, but also because it creates a less hospitable environment for dust mites. Check for other allergen sources such as: hidden mold colonies that may be out of sight behind walls or under floor boards...or sources of Volatile Organic Chemicals or Formaldehyde from construction materials. It can be near impossible to find the true culprits causing indoor allergies or Sick Building Syndrome. For example, most modern air-tight homes have elevated levels of various toxic chemical gases accumulating. But fixing that common problem is not always easy because it can be hard pin-pointing what thing(s) inside, under, or adjacent to the home may be poisoning the air. To help identify which of over 400 common chemical pollutants may be a significant issue and to know what the possible source materials may be so they can later be removed or reduced, I highly recommend you consider this affordable yet high quality diy indoor air quality test. I find that air test kit to be an excellent, cheap, and accurate way to quickly get a clear indoor air quality battle plan showing likely priorities for source control action...for an ultimate fix. This is the same test kit the experts use, but I make it available from the above page without the middle man mark-up or need for the expert to run or analyze the results. Just flip a switch, let it do its thing, and then send it in for analysis and a detailed results report a few days later. Shipping and everything else is included in the one unbelievably discounted price. I love those little magic boxes because they enable me to offer hope to all the long suffering homeowners who frequently contact me for help. Many indoor air pollution cases are not at all cut and dry. 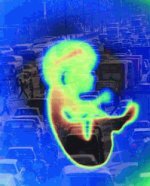 There can be many variables involved, so a diagnostic tool to test the air for a broad spectrum of pollutants is required. One recent example was a nurse who was literally being poisoned to death by extremely dangerous levels of gasoline fumes from combustion equipment in the garage beneath her apartment. Another example was a homeowner suffering from chemicals in dryer sheets. And yet another was someone poisoned by fumes from mothballs used as a rodent repellent in the attic. Homeowners have saved tons of money doing their own air check and finding out what sources they might be able to fix themselves without hiring expensive indoor air quality experts and remediation contractors. 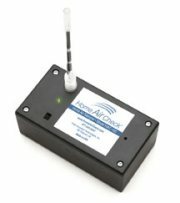 Another great thing about that air test is the fact that it is one the few sensitive enough to detect even hidden mold colonies (which may well be a problem in your home given the history of water damage + your symptoms). Everyone else sells inaccurate mold spore tests which often can't detect colonies hidden inside structures. The one I recommend detects even trace quantities of the tiny gas molecules (MVOCs) the growing mold colonies emit. So even walls and flooring is no barrier to detection since these molecules can diffuse through and around structural barriers. If favorable conditions still exist or recur, Toxic Black Mold will often re-grow from tiny spores, no matter how well a mold remediation was previously done. Though source control is the ultimate solution, the above HealthPro Plus air cleaner will also have no problem efficiently filtering out any allergy-inducing mold spores, even those finding their way into the living space via drafts through crevices where hidden mold colonies may be growing undetected. However you mentioned a "mold killing" air purifier. No home air purifier will be able to kill any mold colony effectively though there are expensive remediation services that employ industrial strength ozone generators ("Ozonators") to fight mold / odors / smoke damage when buildings are not occupied (Ozone is very reactive and toxic to breathe, thus NOT recommended for residential occupied air purification). Mold Spores however can be filtered out and there are also incinerating type air cleaning units (they still emit combustion particles though because they have no HEPA filters to capture the burned remnants and other gaseous pollutants). THE best solution for mold mitigation is to eliminate any moisture sources (condensation, and leaks), find the mold colonies, clean it, or replace it. Anything else will be a less effective stop-gap measure. I'd first use the above test kit to know if there might be a mold issue. Click below for current pricing and deals on IQAir HealthPro Plus HEPA Air Purifiers - the world's best and most powerful air purifier for mold, dust, pet dander, chemicals, odors, VOCs, and other causes of allergy and asthma symptoms.